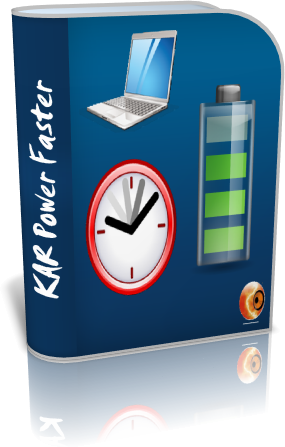 KAR Power Faster allows in real time - according to the use made of the computer - to automatically adjust (totally transparent for the user) different strategies allowing the processor to better manage the PC. The battery can even double his life! 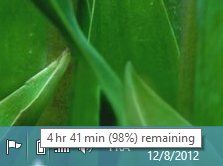 You can see the time remaining by putting the mouse cursor over the battery icon. 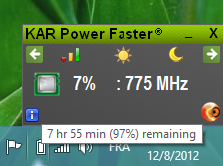 KAR Power Faster extends the battery life by simply adapting the processor to your real needs. Computer's damage is most often related to overheating. A processor can quickly reach 90°C when it is known that the maximum temperature to not exceed is 110°C. The fan will turn very quickly, make noise and consume a lot of energy. Looking at the historical memory usage (in Task Manager and the Performance tab) you will see that the applications are continuously loaded and eventually saturate the computer. 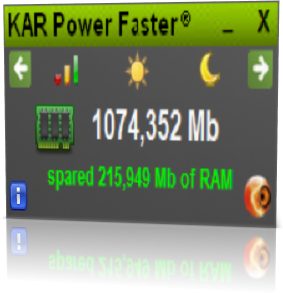 With KAR Power Faster you find the periodic cleaning of memory and a reduced space of the applications without performance degradation since it will optimize your computer by speeding it to 5 times with less heat!